sweet child of mine. . Wallpaper and background images in the Sesshomaru and Rin club tagged: rin sesshomaru jaken. 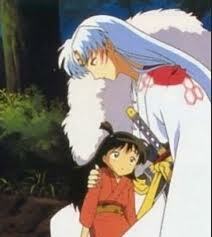 This Sesshomaru and Rin photo might contain anime, banda desenhada, manga, desenhos animados, mangá, and quadrinhos. best imagens i could find!